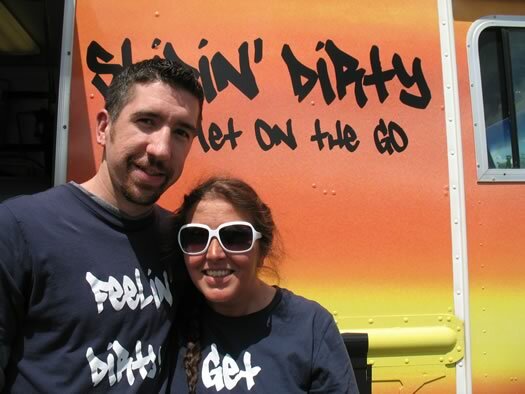 Slidin' Dirty is the creation of Tim and Brooke Taney, a married couple with two small children from East Greenbush. Until recently, Tim was the food service director at Hudson Valley Community College. And Brooke has her own crafting business -- she sells at the TightKnit market in Troy. "After you've worked contract food service for a while, it stops being about food," Tim told us today, alluding to how all the focus is on budgets, staffing, and management. "I wanted to get back to a sort of grass roots food service." So he and Brooke looked for a new opportunity. 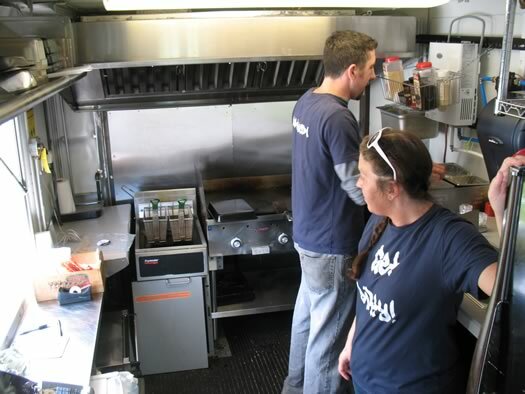 They originally thought they'd open a restaurant, but the startup costs were daunting. So they turned their attention to a food truck. They found an old FedEx truck, modified it themselves with the help of friends and family, and were on the street for the first time on St. Patrick's Day. They've only been operating regularly for the last few weeks. And what about the name? Tim says they were trying to think of some play on sliders, and then he heard the Chamillionaire song "Ridin'" ("ridin' dirty" is party of the chorus) and it clicked. Also, they liked the way the name sort of spoofed the notion of the dirty water hot dog truck. "Our lawyer said to us: Are you sure you want 'dirty' associated with the name? But Brooke insisted. She loved it." Slidin' Dirty's main focus is sliders. We tried two of them today: the "Avocado Beef" -- a beef patty with fried avocado and horseradish cream; and the "Dirty Veg" -- fried tomato with fresh mozzarella, pesto, and a balsamic reduction. They were good. The burger was juicy, the toppings crisp. And the fried avocado -- not bad! Crunchy and then creamy. 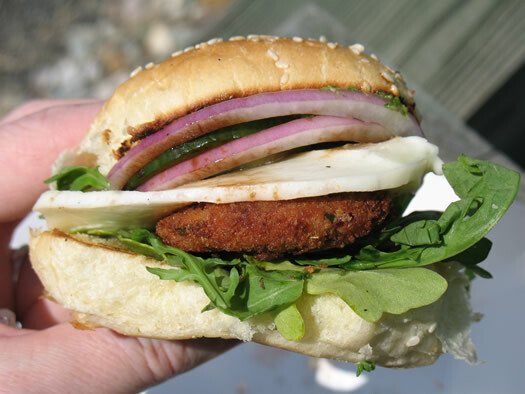 The veggie sandwich was flavorful thanks to some zippy pesto. Tim says they're aiming to serve gourmet food that's creative and easy to eat. For him, that means: "Buy it fresh, serve it fresh. Good ingredients. We make just about everything from scratch." They've managed to squeeze a full size residential fridge, a deep fryer, a flat top, a convection oven, and a crock pot onto the truck. Still, there's only so much room -- so they have to focus their list of ingredients. 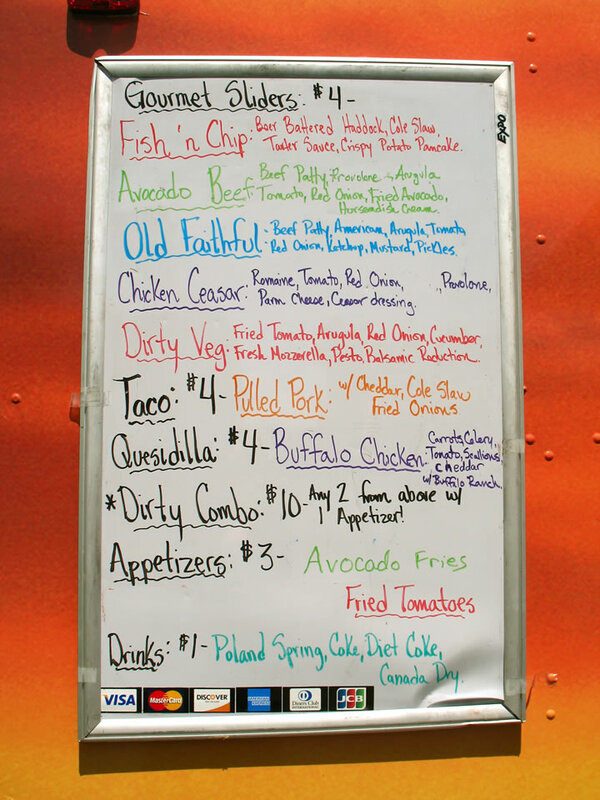 But they're managing to turn out some creative food, rotating options on the menu (today's posted menu). For example, one of the sliders available today was "fish and chips" -- a beer-battered piece of haddock with cole slaw, tartar sauce, and a crispy potato pancake on the slider. And there's the fried avocado, which we have to admit we were a little skeptical about. Explained Brooke: "I'm a big avocado fan, I love guacamole. And we've never seen anybody in the area [serve fried avocado]. So we tried it, had some people taste it, and it was a hit." And, as we said above, it's good. Brooke says they usually sell out of the fried avocado -- they also offer it as avocado "fries" -- on the days they offer it. 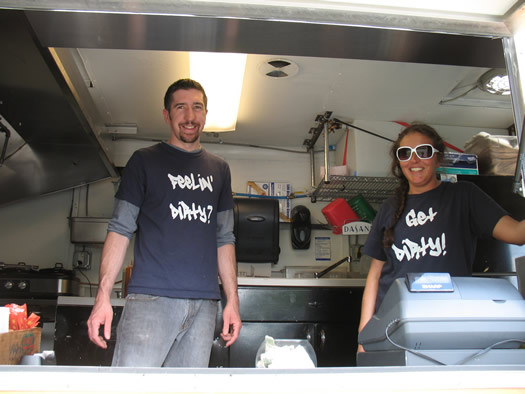 In addition to the culinary challenges, Tim and Brooke says they've also had to learn a lot about how to navigate all the various permitting processes in the Capital Region -- processes that aren't necessarily food truck friendly. "Troy wasn't sure what to do with us," Tim says of approaching the city for permission to set up downtown. He says the city's codes make it hard for food trucks -- for example, technically a truck isn't supposed to operate within 200 feet of another business. They were able to work things out with help, though. "[The downtown Troy BID's] Elizabeth Young has been really good to us," said Tim. The city of Albany is another challenge. Outside of Capitol Park, Tim says the rules make operating a food truck difficult anywhere that's not private property. But, like with Troy, they're trying to work through the issues. The municipal structure of the Capital Region also makes things difficult. Even though the rules from county to county are basically the same, Slidin' Dirty had to get separate licenses for Rensselaer and Albany counties. It's hoping to get its Saratoga County license this week. And they're looking at Schenectady County, too -- but the time and money involved adds up. 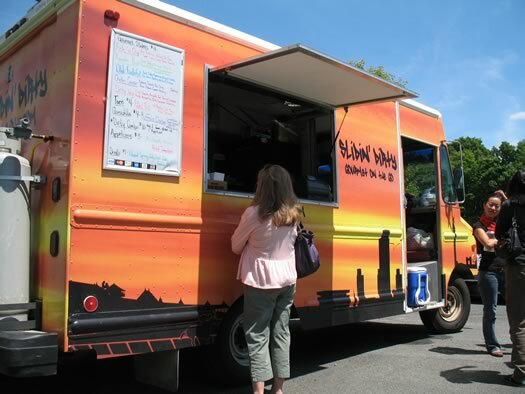 "There are a lot of cities where food trucks are a staple," said Tim, pointing to places such as LA, where trucks travel around the city, communicating with customers via Twitter and Facebook. "We'd like to bring that here." He and Brooke talked today about wanting to see other food trucks take to the streets of the the area -- and maybe they could coordinate meetups in order to offer a range of options. Whatever happens, it sounds like the couple is enjoying the change in their life. "We definitely get to see each other more now," said Brooke smiling, "though we still don't eat dinner until 9:30." Added Tim: "I wake up every day anxious to go to work -- it's been a long time since that." 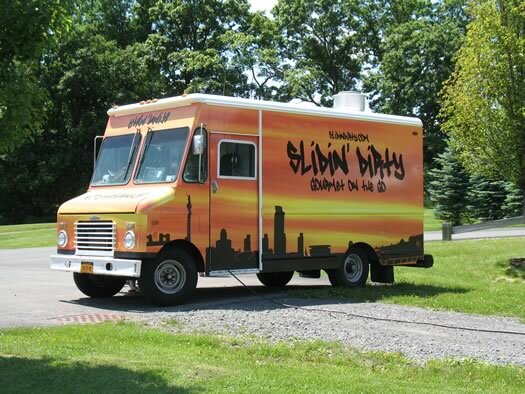 Slidin Dirty's schedule is posted on its website, as is its weekly menu. They also post updates on Twitter. They'll be at Art on Lark this Saturday. And if everything checks out with Saratoga County, the Beekman Street Arts Fair on Sunday in Saratoga Springs. Ah ha! Now I know what they meant by gourmet food trucks on the Beekman Street Art Fair postcard. Oh, you were in my neighborhood today! I walked right by the truck during my lunchtime stroll. Been thinking I should give it a try - thanks for the writeup! That avocado beef slider sounds good. Ahh I am so sad I missed this! The options for lunch out in EG area are limited and this would be a nice change. I will defnitely have to check them out when they come back to EG! Love it all!!! Can't wait to get them up to Saratoga!! Love all of the choices and options from you guys. Always fresh and oh so good...egg rolls are to die for and a must when I stop by. If you haven't checked out Slidin Dirty, you're missing out on something the area doesn't have to offer...you won't be disapointed! Come ona my house, my house! I'm gonna buy your burgers. 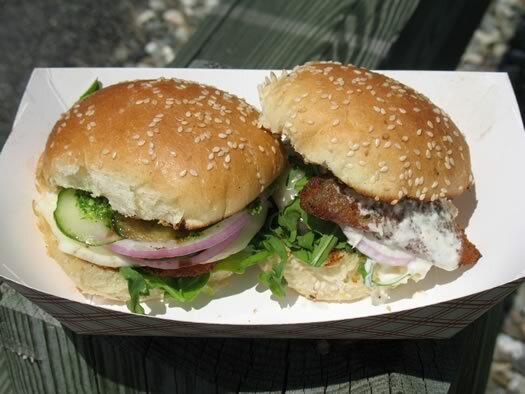 Had some sliders Saturday on Lark Street - DELICIOUS! Only wish I had bought more than 2 sliders, and I wish the cold noodles weren't spaghettini. Worth the wait! Great buns! Good for these guys. 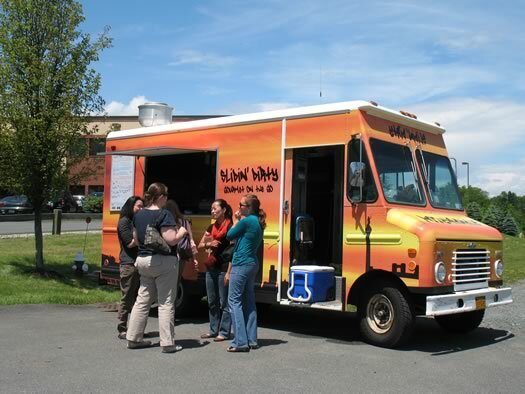 You know though there have been food trucks selling various good foods around the plaza in Albany for YEARS. I desperately wanted to try this situation at LarkFest but they were too busy for my short patience / empty stomach! Sooner than later, I hope. I had them today at there first day at the Empire Plaza, the burger (bacon) was delicious and so juicy and the roll it was in was good quality. The greek egg rolls were fantastic too with a zingy feta dipping sauce. Loved it! Tried Slidin' Dirty at Tulip Festy in Albany and loved it!! Can't wait to see you guys on Saratoga nights and at lunch time in Schenectady!!! Is there any sort of food truck database? So you know what your options are without hoping to happen across one randomly on the street? We just started a food truck in Schenectady. Our name is the Wandering Dago.